Patch Adams is a terrible movie, but the true story behind it inspired the advent of the Medical Clown (MC), a trained clown performer regarded as a therapist. Medical clowns have been used successfully to reduce pre-operative anxiety (Messina et al 2014) and distress associated with invasive medical procedures and examinations (Finlay et al 2014). Goldberg and colleagues (2014) tested the efficacy of the “Dream Doctors” medical clowns in easing anxiety and pain in children undergoing allergy skin prick tests. Skin prick tests (SPT) are common in the evaluation of allergies and involve pricking the skin to introduce small amounts of allergens for testing. The multiple skin pricks and resulting visible reaction on the skin can be distressing for children and their parents. To test whether or not the presence of a medical clown during allergy SPT reduced pain and anxiety, 91 children were assigned to either clown (n=45) or no clown (n=46) conditions. The children (54 boys and 37 girls) were aged between 2 and 17 with an average age of just over 8 years old. They sensibly excluded children with a fear of clowns (coulrophobia) and children who had suffered a painful medical or dental procedure in the last 3 months as they were likely to have elevated anxiety. The SPT was carried out on the inside of the child’s forearm meaning the child could see any reactions to the allergens. The whole procedure was videotaped. 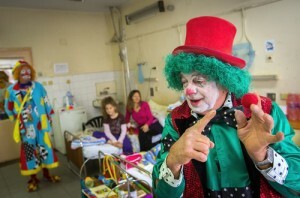 For the intervention group clowns were present in the waiting room, during the procedure, the 15 minute wait time and while the results were read. Children aged 8-17, and their parents completed the state trait anxiety inventory (STAIC or STAI) before being assigned to either clown or no clown condition and again after the procedure. For younger children (aged 2-7) their anxiety and pain was rated by a psychologist from edited videotapes of the child’s behaviour during the whole procedure. The video tapes were edited to remove any indication of the clowns presence or absence and the psychologist was unaware of the group allocation. The psychologist rated anxiety using the modified-Yale Preoperative Anxiety Scale (m-YPAS) and rated pain using the Face Legs Activity Cry and Consolability (FLACC) schedule. Children over 8 years old rated their own pain after the procedure on a visual analogue scale (VAS). Trait anxiety, which measures tendency to be anxious in day to day life, should be stable over time and as expected there were no differences between groups in trait anxiety before or after the procedure. State anxiety, which captures anxiety at a particular point in time, did show a difference as expected. Children and parents accompanied by clowns had lower anxiety than those without clowns. This was true of both children’s own ratings and observer ratings of child behaviour. 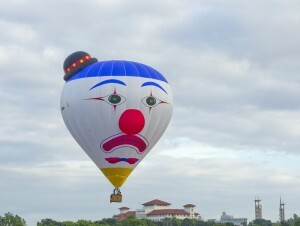 Pain was also lower in the clown group than in the control group, but only as judged by observer ratings. The difference in child reported pain between the groups was small and not statistically significant. Pain was also lower in the clown group but only as judged by observer ratings; while the difference in child reported pain between the groups was small & not statistically significant. Helpfully *sarcasm alert* the authors didn’t report effect sizes, change scores or confidence intervals and the tables did not contain standard deviations. The dense results paragraphs are not clearly presented and so are irritating to read. There is no commentary on the clinical significance of the reduction found in pain or anxiety – the numbers are not given any context to help the reader interpret whether the clown’s impact is big enough to warrant the extra effort and cost of having clowns on the ward. Out of curiosity, I calculated the effect sizes. The largest effects were in older children’s self-rating of anxiety (cohen’s d= 1.17) and observer ratings of pain (cohen’s d=1.08). Older children’s (8-17 years old) self-rating of pain was not markedly improved by the presence of the clown (d=0.31, not statistically significant). You could argue that observer ratings are a better metric as the observer was blind to group allocation, but I would disagree. The child’s subjective experience is what the clowns are trying to change and so in this case the child’s self-reports are, to my mind, more important. It is frustrating that there was no attempt to allow younger children to rate their own anxiety or pain. 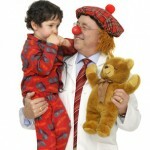 Medical clowns significantly decrease the level of anxiety perceived by both children undergoing allergy SPT and their parents, as well as the pain perceived by young children. While the clowns did reduce anxiety in parents and children, it is not clear how clinically relevant or useful this reduction was. Pain did appear, to an external observer, to be lower in the presence of clowns but this was not reflected in older children’s subjective pain experience and younger children were not asked about their own pain. The anxiety levels and pain ratings were relatively low in both groups. It may be that the clowns would be more usefully deployed when a child is undergoing a more serious or painful procedure. The authors themselves note that the same effects might be found using cartoons or video games, more easily and with less cost. The lack of context provided by the authors is frustrating and ultimately hinders any clear recommendations on the use of medical clowns in this situation. I am hopeful though that the medical clowns would be at least slightly more entertaining on a ward than Patch Adams was on screen. Children and parents accompanied by clowns had lower anxiety than those without clowns but it is not clear how clinically relevant or useful this reduction was. In the round, there are a couple of other actors in this world that aren’t included. What do the clowns get out of this (I think most are volunteers?) – how much does their life improve? And how much does the wellbeing of the doctors decrease when surrounded by Bleeping Beppo? Good questions! 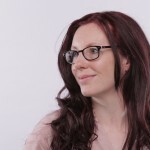 I imagine the volunteers get a lot of joy out of feeling helpful – they wouldn’t put themselves in challenging situations otherwise, like recently https://www.youtube.com/watch?v=CF-SbFXlf44. As for doctors any decrease in wellbeing probably correlates with their irritability!